Summary: Reebok are quickly gaining a reputation for pro level home fitness equipment. There are ZR models for treadmills, bikes and now for this popular home elliptical trainer. This has slick good looks, though it is what is under the surface which makes it stand out. Benefits include flexible resistance levels, a good electronics setup and fully adjustable foot plates. As you might expect, buyers are very happy with this pick. Check out the impressive pictures and that feedback on this dedicated amazon.co.uk product page now! The unit you’ll get looks stylish and solid. Glossy black is highlighted by a bright yellow trim, along with the familiar Reebok logo. You’ll immediately see what makes this a sturdy model. Underneath are two wide supports, each with plastic ends. Overall, this unit is bigger than many of the budget end elliptical cross trainers – though not as large as those you will find in a commercial gym. It is 63cms wide, by 144cms long and 169cms tall. This is a heavy unit (which really helps with the stability), weighing in at just over 50kgs. Some assembly is required (fitness equipment very rarely ships complete). Some people complained that this was difficult, though others found it simple. If you are unsure, then you can always enlist some help! A big plus is the console – great tech for the price. You have pre-set workouts, and can also program this to suit your own needs. You will see the options and buttons available on the close-up in the picture gallery at amazon.co.uk. 32 Levels of resistance is more than most cross trainers offer. You can start off very light, and if you have never used an elliptical, then I suggest you warm up slowly. This amount of versatility also makes the Reebok ZR8 suitable for multiple family members. People often bought this elliptical alongside a quality rubber mat. This will help stop the machine moving, and keep things quiet as well as protecting your carpet. 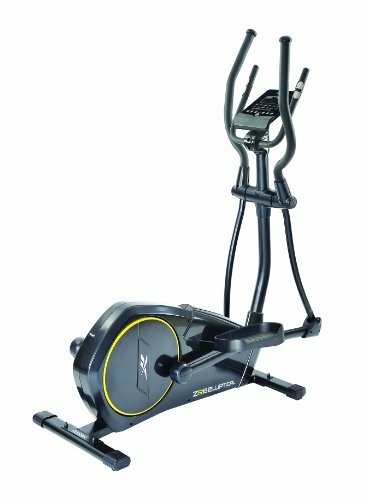 What Previous Buyers Said About the Reebok ZR8 Elliptical? There are two camps when it comes to putting this machine together. Some people blamed just about everything except the family cat when it comes to assembly. Others said this was very simple, and just a matter of laying out all the parts. Overall, the words which appear often are variations on ‘fab’, ‘brilliant’ and ‘quiet’. There is a lot of enthusiasm about this unit. If you strip out the grumbles about assembly from the feedback, the rating would be very high. Some people complained of squeaks. It seems that tightening the bolts after a couple of weeks; use is a good solution for this. Some people also mentioned WD40! Overall, very positive feedback, especially when you consider the lower mid-range price point. Wrap Up: Is the Reebok ZR8 Elliptical Cross Trainer Right for You? Reebok’s growing reputation, along side the competitive price of this cross trainer, help this model reach many people’s shortlist. Ellipticals will give you a good cardio workout, without the joint impacts of some other equipment types. This unit looks the part, and has some serious elements under the hood. Smooth resistance, 12 programmable workouts and adjustable pedals make it work well for all the family. If you are looking to burn those calories smoothly, quietly and in style – then the Reebok ZR8 could be for you! Check out this dedicated amazon.co.uk product page for yourself now!